The Cuckoo wasp is an eye-catching creature that is easy to see. Its brilliant turquoise color is created when light refracts between hollow layers of the exoskeleton. This adaptation makes the stealthy insect virtually invisible when it enters the dark burrows of its prey. Foraging for nectar during a hot afternoon. 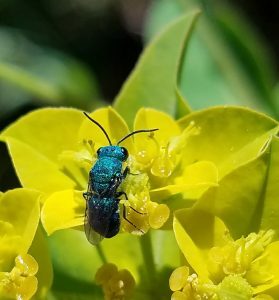 Cuckoo wasps are most active between May and August. The Cuckoo wasp is parasitic. It watches and waits to find ground bee and wasp nests. To enter, it will often hitch rides on victims being dragged inside. The bumpy exoskeleton of the Cuckoo wasp protects it from stings. It also has an indented midsection, like a pill bug, that allows it to curl into a ball– another protective measure. Once inside, the Cuckoo wasp lays its eggs inside the host larvae. Its stinger evolved into an egg-laying tube, so it couldn’t hurt you if you wanted to let one crawl on your hand. One species of Cuckoo wasp first came to California from Africa in the mid-nineteenth century. It parasitized mud dobber larvae aboard sailing ships. If you enjoyed this post, you might also like Pill Bug – Heavy Metal Detector of the Underworld.